One month is a long time in dog training. When you haven’t started, a month seems like a long time. Pretty soon you’re a week into things, and you don’t feel powerless any more. You’re not plagued by that nagging feeling that you’re short changing your dog, and failing to step up to the plate as a dog owner. 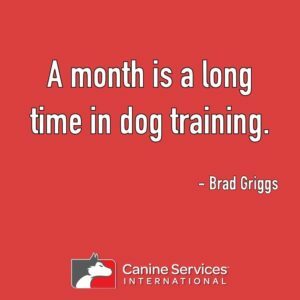 For most dogs a month is all it takes for you to start seeing things ‘come together’ in your training plan. That is of course, if you *have* a training plan. If you don’t have a training plan, then how do you know the direction of the work you need to do to achieve your goals? Breaking goals down into milestones is one of the key components for folks to be successful in the training of their dog. When you reach a milestone, the goal is that much closer – and if you’re training in a smart, committed way then it helps you to see (and feel) you’re finally making real progress. That’s one of the areas in which a high quality dog training coach can be of help to you and your dog. One thing is for sure – if you never start the journey, you’ll never reach your destination. So get up, get moving, and empower yourself and your dog through learning together.